If you know me, you know my love of pumpkin runs deep, but a close second place is peppermint. 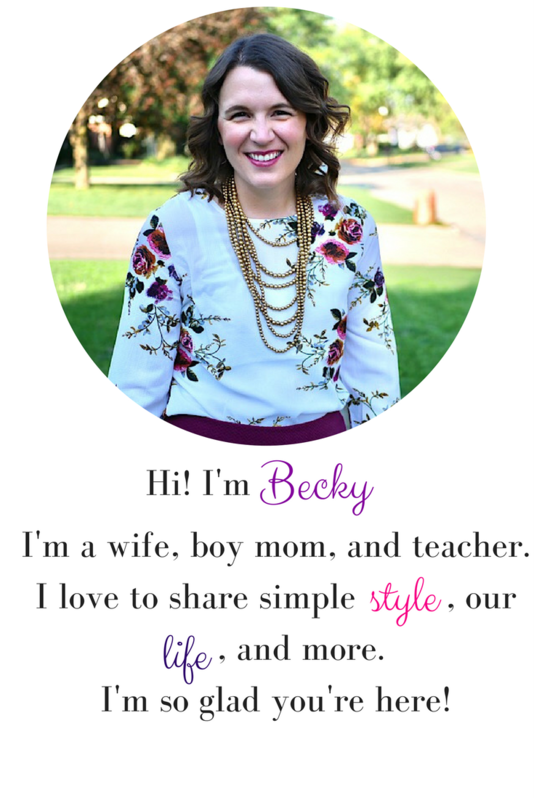 I love peppermint lotions, gum, and snacks, which makes me totally love this time of year and all its peppermint goodness! 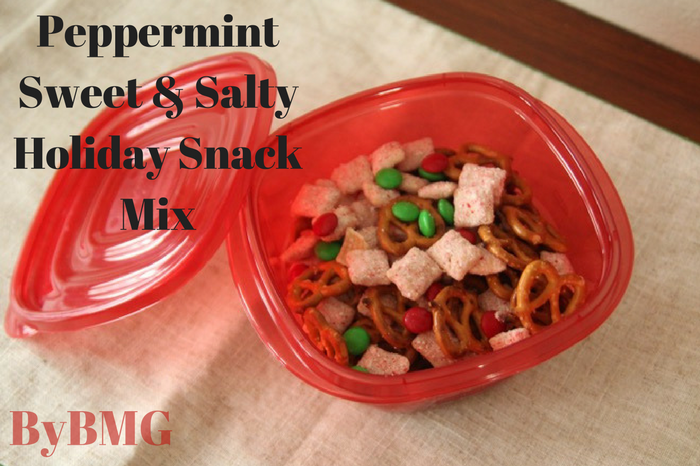 Today I wanted to share a yummy and pretty simple snack mix that involves peppermint. I whipped this up in less than 30 minutes from start to finish! First off, I melted the almond bark in my double boiler. I like melting chocolates and almond barks with this method because it's a little slower paced and don't have to worry as much about them burning. Basically a double boiler consists of a pan with water in the bottom then the double boiler on top. The water boils and makes heat to melt the almond bark or chocolate without being directly on the burner. While the almond bark was melting, I took the candy canes and blended them up. It made a nice peppermint sugar somewhat like a powdered sugar and normal sugar mixture. Once the almond bark was melted, I gently folded it into the cereal. Next, I put the coated cereal and the peppermint "sugar" into a baggie and shook it all up until it was all coated. Last, I transferred it to a bowl and gently mixed in the pretzels and chocolate candies! This mix is the perfect holiday gift for a teacher, helper, or hostess. 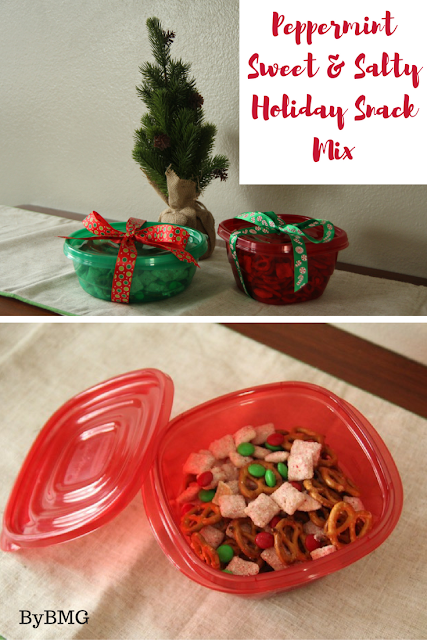 To package it up and make it pretty, I used Rubbermaid TakeAlongs in their festive holiday red and green limited edition colors to along with a little festive ribbon! You can find this festive containers at your local Walmart now through December 24th. They're located on an end cap in the housewares section. Some of the best things about Rubbermaid TakeAlongs are that they're dishwasher and microwave safe, they have a Quik Clik Seal™ that keeps food secure and helps prevent spills, and they have an easy open tab! For more holiday inspiration, head here! 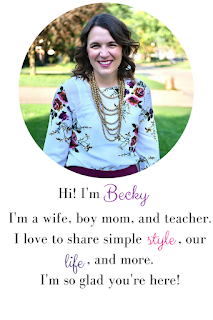 Linking up with Idea Box, Tuesday Talk, Foodie for a Year, Happy Now ,and Creative Corner.